Samuel Arbesman • Current (Penguin Group), 2012, 242 pp. Here you see the problem. We move from the opinion of tobacco vendors to a meat controversy that is now “a matter of opinion”; to a recommendation (about mammograms); before we finally meet a fact that was dead wrong. 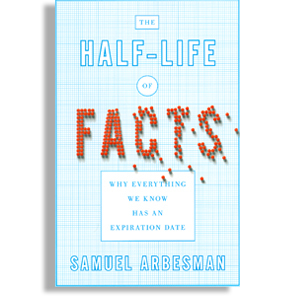 Arbesman offers many reasons why facts are refined or changed. More scientists with more training and more gadgets are a fertile source of facts. Newer instruments give, for example, a better fix on the distance to the sun. Some facts are fixed — the half life of an element, or the diameter of a proton — and any “change” is due to increased precision — which is neither startling nor regrettable. Even when Arbesman strays from what I’d define as facts, he offers gems. Readers of a certain age will relish the decimal-point error that caused comic-book creators to give Popeye the sailor man an obsession with spinach. But is it noteworthy that a “fact” about the iron content of spinach was changed to correct for a clerical flub-up? I was delighted to read that Prof. Moriarty, an arch-villain from the Sherlock Holmes stories, has actually been cited in the scientific literature. Oops! And who knew that the proportion of consonants in Old English — a thousand-year old language that is unintelligible today — is essentially unchanged in modern English? Yet Arbesman strides into quicksand as he discusses “our linguistic facts.” If words change meaning — if “obnoxious,” for example, no longer means “subject to injury” — has a fact changed, or our behavior? The fact is language evolves, as witnessed by the very changes Arbesman cites. Although it’s been about 2,500 years since the Greek philosopher Heraclitus observed that “the only constant is change,” some facts are rock solid. Opposite charges attract. Ice is cold. And Earth will be orbiting the sun for a good long while.